Written by Janet Choi on February 5, 2015 . …unless you know something about your audience, which you really should. In which case, the previous point is probably wrong. Use […] A/B testing to get a better answer. We thought we’d break down this formula to smaller, actionable steps, guiding you towards discovering your optimal email sending times. There’s an inherent problem with looking to averages when trying to determine something specific — especially something as specific as what is best. Blending metrics up into averages and aggregates means you lose context. For instance, when these data sets smash all sorts of email together, from automated welcome emails to cold sales emails, does that really help you decide when to send out that blog post link? All these data and numbers and graphs — they’re interesting, even enticing. They make you go, “hm!” while stroking your chin in wise, email expertise-y thought, but they don’t provide you with a plan. Instead, these generic bullet points are baseline figures for testing the waters or just getting your email out the door. When I look at those optimal send time graphs, the one thing that stands out across all of them is that I’m not surprised by any of them. What kind of sender are you? 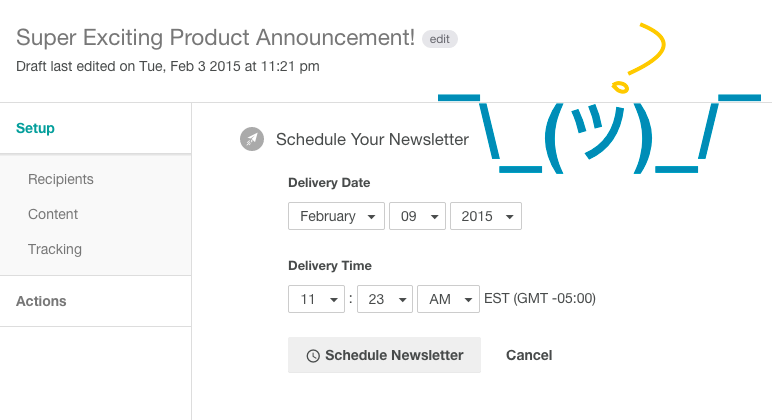 Your business and brand already sets the tone of your emails — and informs their timing, too. If you’re a B2B company, weekdays during the workday are a better place to start. If you’re a lone freelancer or scrappy entrepreneur, maybe taking advantage of the weekend makes more sense. Are you a foodie publication? Maybe send out your amazing recipe newsletter at lunchtime. Where is your audience? Are all your readers in your local timezone? If not, be mindful of where they are, especially considering the tendency for people to open an email, if at all, within an hour of delivery. If your audience is located across all sorts of geographies and times, you could split them up into a few segments. When is your audience active online? People check their email all the live long day nowadays. The key is figuring out when people’s activity and engagement levels are higher. Patagonia’s system optimizes its email timings for people opening emails on a desktop rather than mobile, because they found that while 65% of customers checked email on mobile, that also meant 35% lower likelihood of opens. For them, pushing desktop views translated into more clicks. Look for other contextual clues. When does your app or website experience increased activity? If your email audience has a sizable overlap with your Twitter followers, you can use a tool like Followerwonk to see what times they’re most active online. What kind of email is it? The best time to send depends on the type of email. 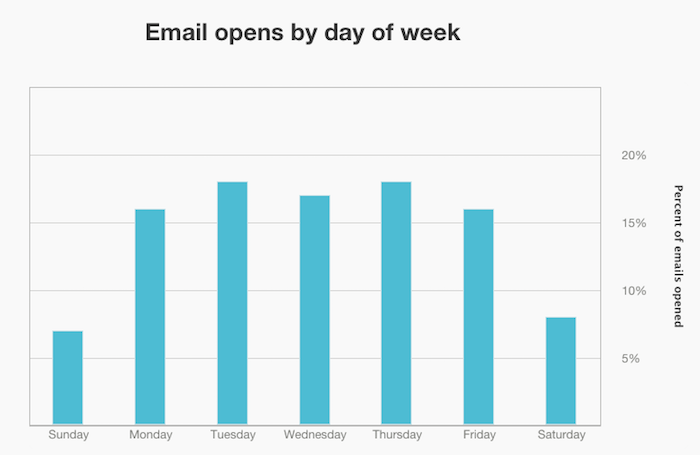 Schedule emails according to what you know about behavior patterns. 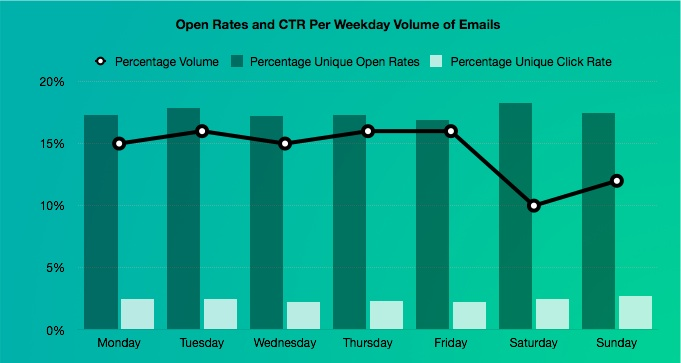 If you see a trend of higher open rates towards the start of the week and higher clickthrough rates towards the end of the week: send educational emails like updates and blog posts earlier and actionable emails that ask for signups, purchases, and replies later in the week. What clues do you already have? Your email history is useful data. Yes, this is imperfect information. It’s only one month’s worth of data of a behavioral email campaign, triggered by people signing up so that they’re more primed to open. (I excluded our welcome email which arrives right after sign-up.) Still, this gives me a relevant starting point based on my existing audience. I’d want to test my promotional emails about the webinar on Tuesdays, Thursdays, and even Saturdays. So far we’ve discussed smarter starting points, but you can’t make progress until you prove these initial theories right or wrong. Testing is a vital step towards discovering your best send times. According to MailChimp’s figures, A/B testing send-time improved opens by an average 9.3% and clicks by an average 22.6%. Schedule the same emails to send on different days or different times (choose one variable at a time!) Don’t stop after just one test and keep gathering and building on data. Nerves and hesitation about testing emails is natural. Take heart in something called the infomercial effect. 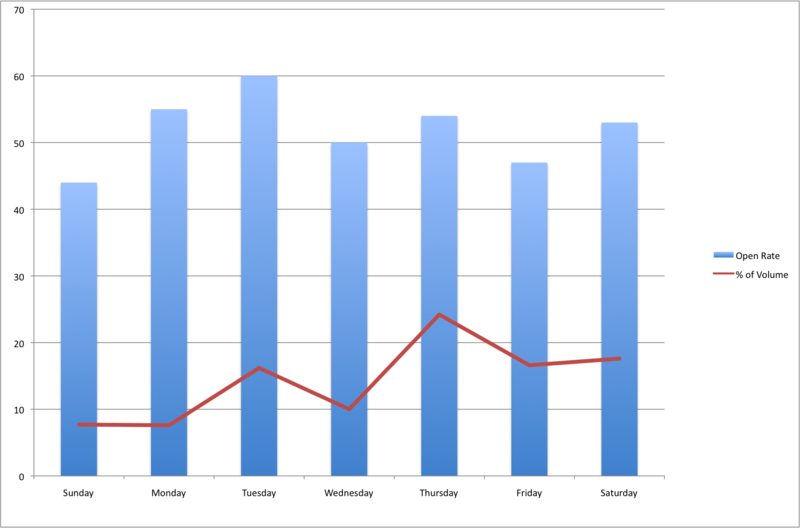 Now, Hubspot’s Dan Zarrella notes that he consistently finds the counterintuitive pattern that Saturdays and Sundays have higher clickthrough rates, and that Wednesday-Friday tends to outperform Monday-Tuesday. Going against the grain of what’s popular can be a useful strategy to help you stand out. There is a trade-off, though. Your message may be more prominent but have a smaller overall reach. Buffer’s Kevan Lee calls this the infomercial effect. 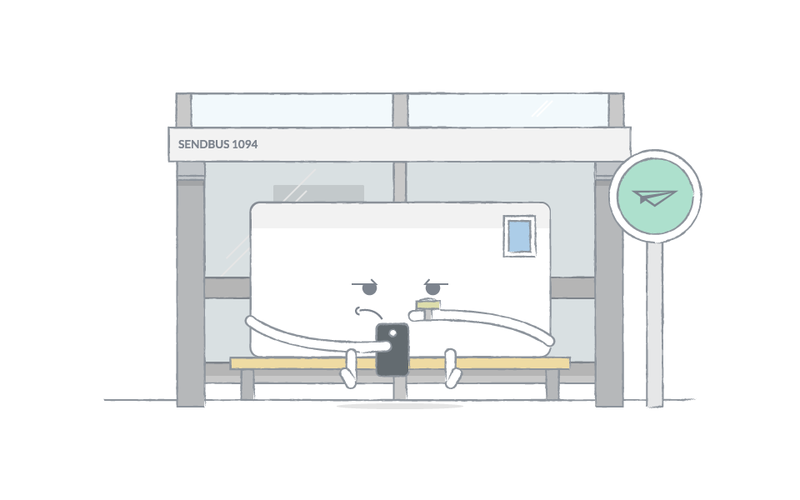 You schedule your messages for quieter, off-peak times because people have less choice to overload them. As Kevan explains, “When there’s nothing else on, you’re more likely to watch an infomercial.” What’s interesting about infomercials is that companies see these graveyard slots as “highly efficient for testing products and messaging against targeted consumer segments,” as Priceonomic’s Jon Nathanson explains. The goal isn’t necessarily to get people at 3 a.m. to buy that Snuggie but to ultimately get into mass-market retailers. Informercials actually serve as testing grounds and fit within the context of a larger campaign. So if you’re feeling anxious that scheduling an email for Friday afternoon or Sunday night will just result in more crickets and tumbleweeds than your normal delivery time — think of it as a useful testing point that’s not meant to maximize reach but to experiment and learn within a longer-range game. Use these slots to test creative messaging copy or new styles — or you might simply find that this off-peak time works better for your audience. If you’ve ever sat, scratching your braincells while contemplating a time and date picker, you know the frustration of trying to choose a sending schedule. You just want a simple answer, already, and that’s why it’s so tempting to look at what purportedly works for other people. But the answer, of course, is in your own hands. Unravelling your best solution depends on your context, your audience, your data.